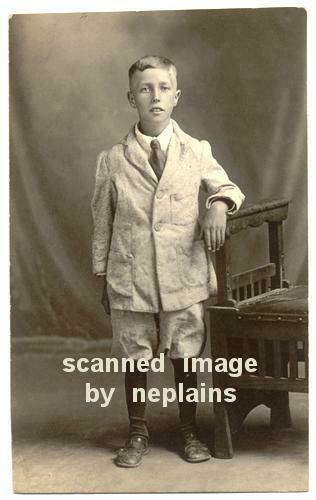 Boy wearing a jacket and short pants while standing by a wooden bench. Location is unknown; photo was found with other items from southeast Nebraska and northeast Kansas. Real Photo postcard, AZO (1910-30). Minor corner wear. Card has been trimmed less than 1/8-inch at top and left edges.